Muwahhideen Publications is very pleased to announce a LIVE Tele-lecture on Saturday 30th November 2013 with the Noble Shaykh Abu ‘Abdul Haqq ‘Abdul Lateef al-Kurdi (May Allah Preserve him) who is from the mashaayikh of Iraq. He is highly recommended by Shaykh Rabee’ al-Madkhalee as well as Shaykh ‘Ubayd al-Jaabiree (May Allah Preserve them). Shaykh Rabee’ said about Shaykh ‘Abdul Lateef, “Hold on to him and his Salafi School with the molar teeth.” He also referred to him as an esteemed scholar and states that he has known him for a very long time to be a person of zuhd and fiqh. He continued by saying his school is of sound ‘aqeedah and manhaj and he knows him to be a person of intelligence. Shaykh Rabee’ further said that the people should thank Allah for having him and his school amongst them and that his status must be recognized. 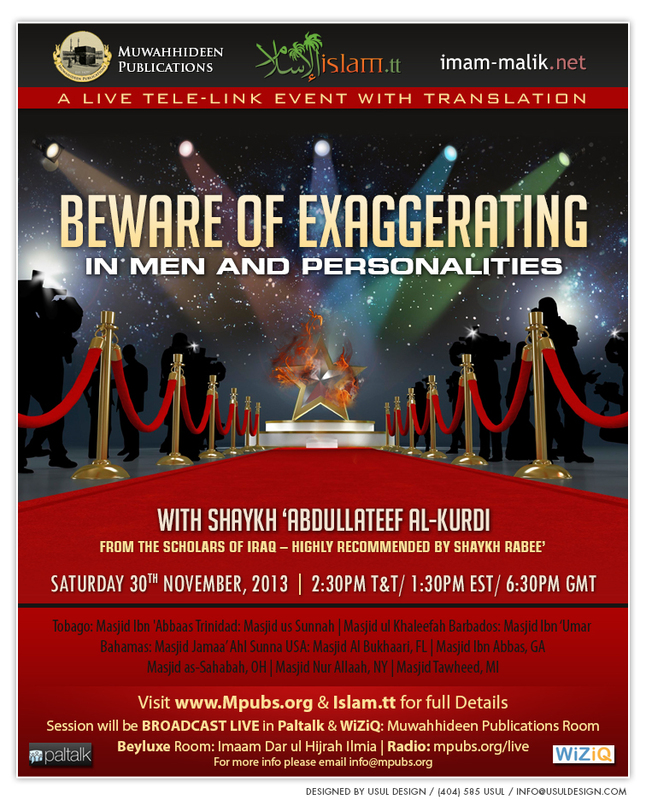 This lecture event will be broadcast LIVE in three Masaajid in Trinidad & Tobago and five Masaajid in the U.S. In Trinidad & Tobago: Masjid Ibn 'Abbaas, Tobago, Masjid ul Khaleefah and Masjid us Sunnah, and in the US: Masjid Al-Bukhaari, Florida, Masjid Ibn 'Abbas, Georgia, Masjid Nur Allaah, New York, Masjid as-Sahabah, Ohio and Masjid Tawheed, Michigan.